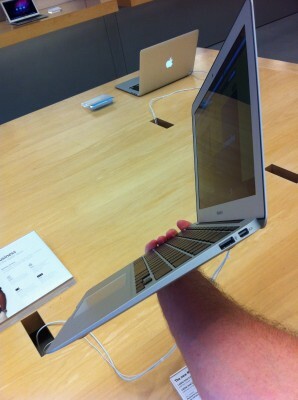 I stopped by the local Apple Store to look at the new MacBook Air. Man it’s so tiny! According to the reviews and to what little I played with it, it seems fast enough for most daily tasks. My only recommendation is to get the one with the bigger 128 GB hard drive. Not a single demo machine at the store had the 64 GB one, they all had the 128 GB drive. And all the demo units had their hard drives already more than half full. You do the math.